The newly named Captain of the Kelowna Rockets is none other than former Thunderbird James McEwan. 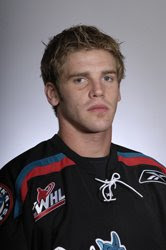 Released by the Tbirds before the 2006-07 season, McEwan made the team in Kelowna and was awared their "unsung hero" award for the season. McEwan is just the 4th Rockets captain to be from Kelowna (although the other three were born in Kelowna, McEwan was not). Also... the first captain in the history of the Edmonton Oil Kings is former Tbirds blue liner Bretton Stamler. Anyone who has known and seen Stamler play should not be too surprised by the 20 year old being selected the Oil Kings' new leader.